Last weekend I attended a foraged wreath making workshop at Weatherlow Farms in Westport, Massachusetts. I met Phoebe Poole of Weatherlow Flowers earlier this year at a creative retreat and have been in awe of her floral work ever since. Phoebe is a flower farmer and hosted this wreath making workshop in the idyllic barn at Weatherlow Farms. I was drawn to this workshop because of the natural look of the wreaths that she makes. Phoebe foraged all of the materials that we worked with and the wreath bases, which are made of grape vines, are reusable which means less waste. I've had zero waste ideas on the mind lately and was excited to learn more about foraging and how to decorate our home for the holidays in a less wasteful manner. 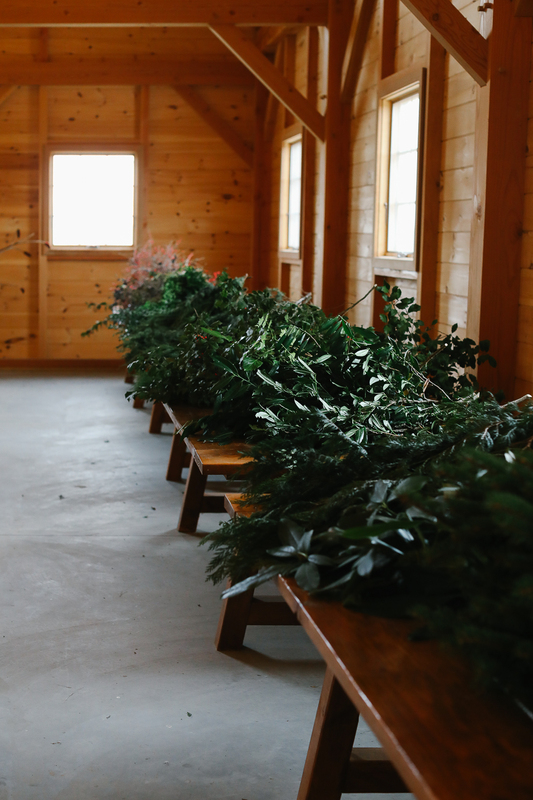 The inside of the barn was lined with tables covered in all kinds of winter greenery, berries, branches and other foraged materials that scream winter and the holidays. I never realized there were so many different types of winter greens of varying texture and leaf type. I recognized a few things like holly, pinecones, sumac and pine, but I have so much more to learn about the plants in our natural environment! My friend Caylin seemed to know the names of every berry, pod and plant on display. Ever since attending this workshop I've been noticing all of the plants, berries and pods on our walks through the arboretum. My eyes are now aware of old grape vines lining the fences of yards in our neighborhood and on a drive up to New Hampshire earlier this week I kept jumping in my seat when I saw "wreath making materials" on the side of the highway. Aka nature. I feel so much more in tune with my natural surroundings after this workshop and for that I am grateful. The sunsets are Weatherlow Farms are unreal. I'm less likely to toss the wreath that I made (it could be composted if need be) and it feels so much more unique than anything I could buy at the store or farmstand up the road. I'm already planning to re-use the base next year. Thank you, Phoebe and Weatherlow Farms for hosting this wonderful workshop and for sharing your creativity with your community! How are you decorating your home for the holidays? Have you ever considered making a wreath out of foraged branches and berries?